Welcome to RoomModes.com, a collaborative arm of Acoustics.com. This site aligns with our goals of promoting the importance of acoustics and acoustic-related issues across a variety of related industries. When analyzing a critical listening room, it is important to examine the ratios of the room's dimensions in addition to the room's reverberation time and any potential problematic reflection (such as from concave, reflective surfaces or peaked/domed ceilings). Certain room dimension ratios are better suited than others for achieving a rich acoustic environment. 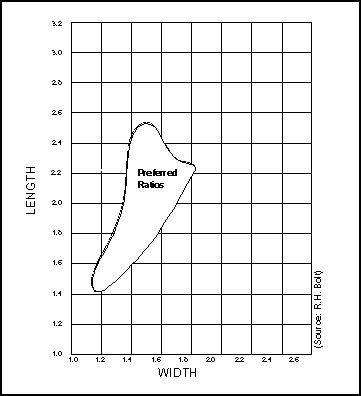 The following Room Mode Ratio Diagram is an acoustical tool developed by Richard H. Bolt. The diagram displays the ratios that are known (based on empirical and mathematical tests) to enhance room acoustics. If a particular room's dimensions are outside of the preferred ratio range, acoustical treatments (such as absorption) that mitigate the negative effects of less-than-ideal proportioning will become more critical. The goal is to find ratios that allow even distribution of sound across the frequency spectrum. When this happens, tones are reinforced equally and the least amount of coloration occurs. Colorations largely determine the quality of sound in a smaller room (such as a studio or home theater). These colorations, caused by room resonances (modes), can degrade the quality of music and speech, creating an unnatural and monotonous emphasis at certain frequencies. Room modes are caused by reflections between room surfaces. There are three types of modes in a rectangular room: axial (sound waves reflecting between two parallel surfaces), tangential (sound waves reflecting between four surfaces), and oblique (sound waves reflecting between all six surfaces). Axial modes have the most influence on the acoustical characteristics of the room. Oblique modes have less effect than the other two. In a studio or home theater, a mode is heard as a coloration of the desired sound by emphasizing the modal frequency. If a certain modal frequency is isolated from its neighbors (more than 20 Hertz separation), its effect is more likely to be noticeable. If modes are widely separated, then the sound will be abnormally weak at the notes between the modal frequencies. At frequencies above 250 Hertz individual modes are seldom distinguishable. Speech coloration below 80 Hertz is rare because so little speech energy is in that part of the spectrum. If there is no spacing between modal frequencies (called a coincident) they would tend to overemphasize the sound at that frequency. When determining optimal dimensions and analyzing room modes, it is best to seek the advice of a professional acoustical consultant. Click here to find an acoustical consultant in your area.